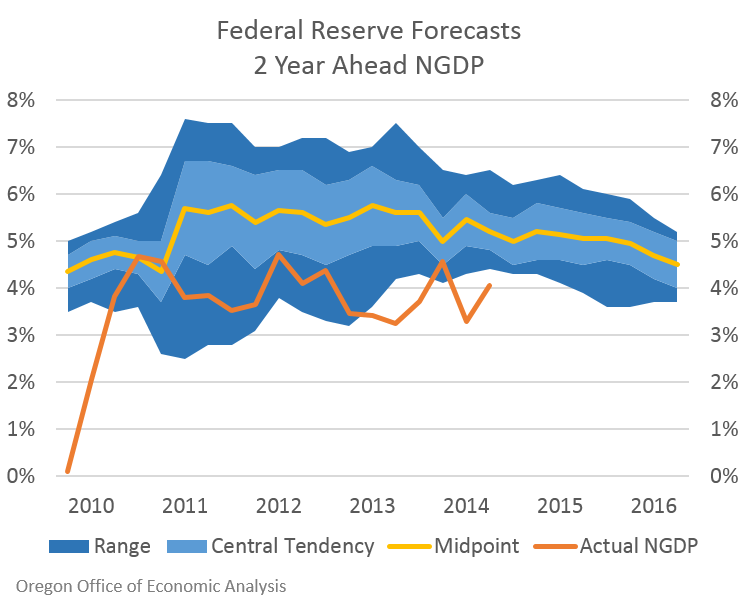 The following compares the Fed’s own forecasts for nominal GDP (actually real GDP + PCE) on a 2 year ahead basis. Most forecasters, including the Fed, have performed relatively well on a 1 year ahead basis but keep calling for an improvement “next year” which has largely not materialized at the national level. Some states, such as Oregon, have seen acceleration in job growth but others have decelerated at the same time leaving U.S. growth at consistent rates. So what does this mean for policy and the outlook? Well, the Fed’s not alone here in believing 2015 will be better. About half of the Philly Fed survey and also the Blue Chip forecasters expected 2015 NGDP to be 5 percent or stronger, while the WSJ survey shows 60 percent of respondents think this will occur. Certainly a mild improvement like this is not out of the question, however to the extent that wage growth remains subdued and the economic data does not accelerate, it points more toward a slow pace of tightening, if/once it begins. Of course as economic conditions change, one would expect/hope policymakers react accordingly — both to the up and downside. Thanks Mary for the comment. It is very hard to see any inflation today, or in the past 5 years. More and more folks are getting concerned about future inflation now that the unemployment rate is approaching rates that historically would indicate a tighter labor market. I think most economists agree that sustained wage gains are needed to see anything other than a commodity blip in inflation. However given the slack in the economy, through various other measures beyond headline unemployment, it appears we are still a good ways off from a tight labor market. So, I agree, but paying attention to the data and debate about the amount of slack is important. The biggest concern is that what may have been at first a cyclical decline (even as deep as it was) is now structural after 5 years of sub-par growth. Outstanding, Josh. I liked the play this got in the blogosphere.